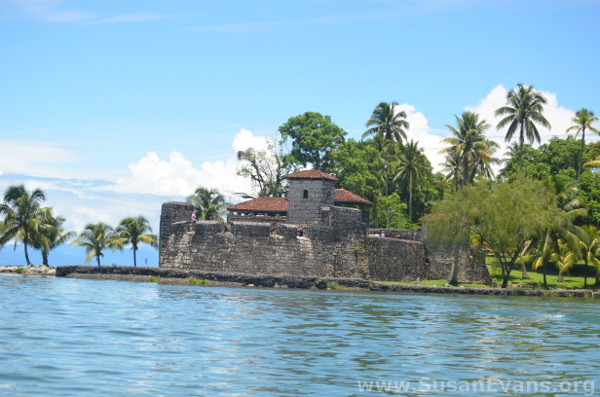 After our Río Dulce boat ride, we walked up to the beautiful San Felipe Castle in Guatemala. If I had known that there was a real Spaniard castle from the 1500’s just a few hours from where I grew up, I would have gone as a child. 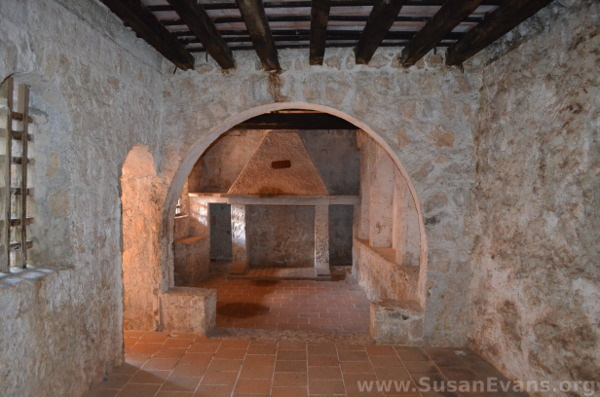 My parents thought it was just a fort with one room, but as you can see from the video tour, there were lots of rooms, complete with a kitchen and dining room, bedrooms, a chapel, a courtyard, and a dungeon. There were many towers to look out over the river. 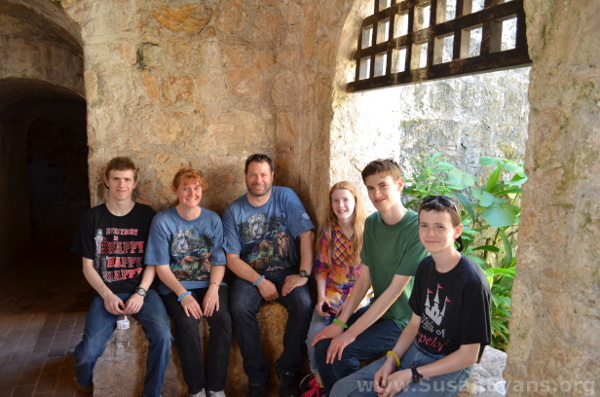 The day that we toured the castle was sunny with clear blue skies. Although it was sweltering hot, the beauty of the castle was a delight. I have always loved castles, and this was no exception. I found myself going in and out of various rooms and corridors, losing myself in the time period of the colonization of Guatemala by the Spaniards. Inside the castle was a large kitchen complete with fireplace to cook whatever wild fowl the hunters found in the river. The area was also lush with banana and coconut trees, so those foods must have been incorporated into their diet as well. I love the look of the Spaniard yellowish-stone walls both inside and outside the castle. 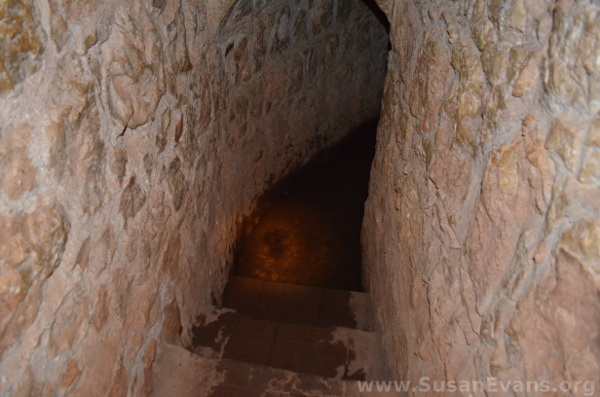 I walked both upstairs and downstairs in this castle, as there were many rooms. It wasn’t just a functional fort for soldiers. It was a fully livable home for that time period, with plenty of space for servants. There was a barracks for soldiers, and the fact that there was a dungeon for enemies with individual cells for solitary confinement was creepy. Cannons decorate the outside of this castle, not only on the top of the castle, but on the grass at the base of the castle, facing out toward the river. 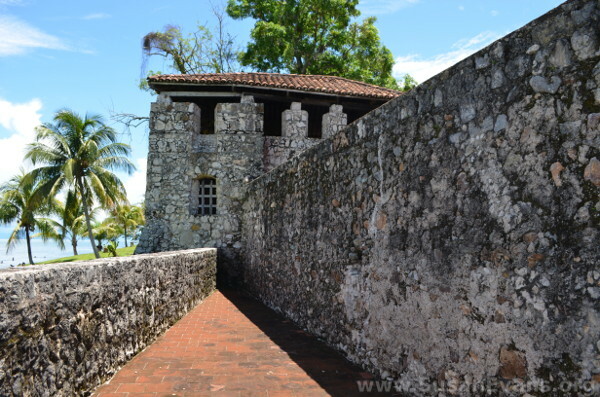 Since the castle is situated on the Río Dulce River, it is protected on three sides by the water itself, and the top of the castle gives a commanding view of the area to prevent any attacks. 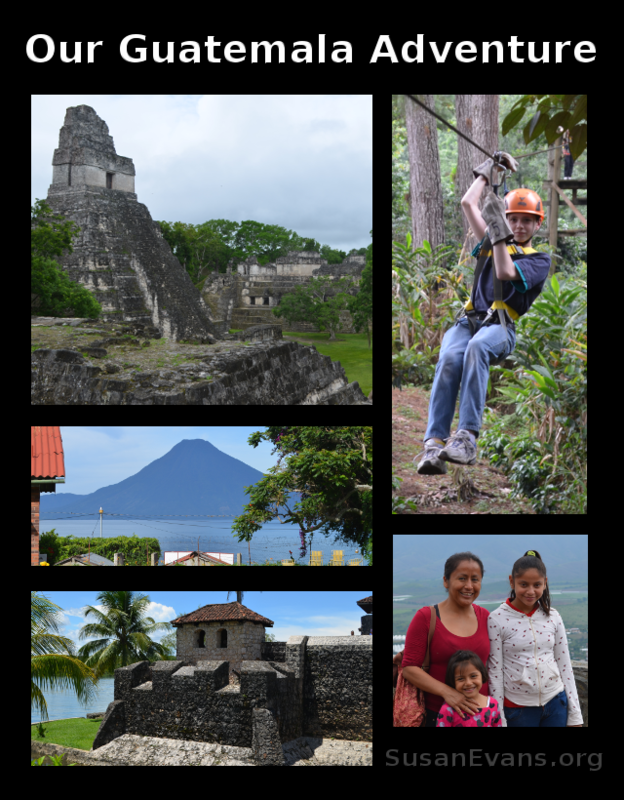 If you don’t want to miss any posts in my Guatemala Adventure series, follow my Missionary Kid page! 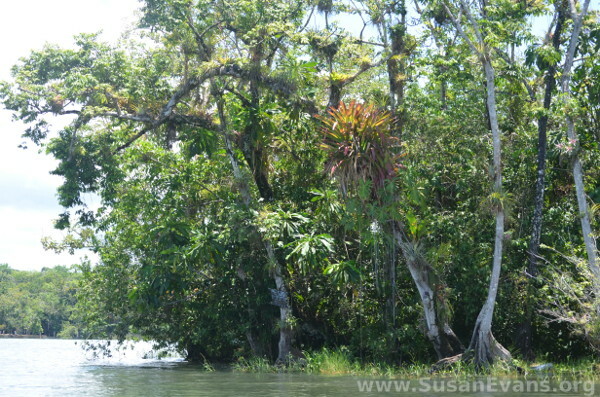 To break up our 10-hour road trip from Guatemala City to Petén, we decided to go on a Río Dulce boat ride, which is near the castle of San Felipe. We buzzed around in a motor boat, looking at exotic birds and wildlife on the edges of the river. 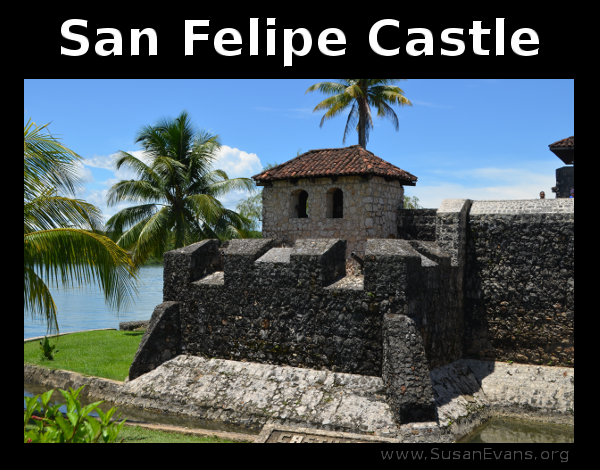 The San Felipe Castle was built on the edge of Río Dulce, so we were able to buzz by it, seeing it sparkle in the sunshine. 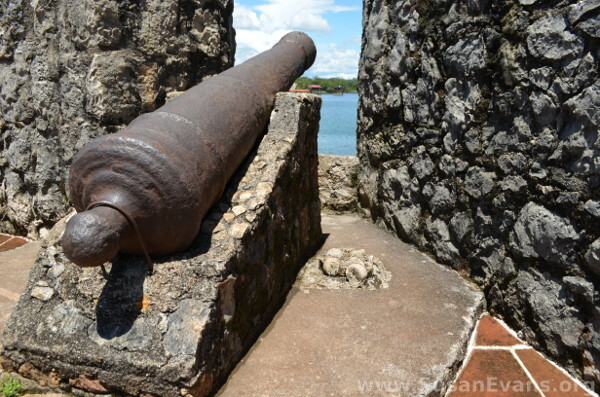 It was built in the 1500’s by the Spaniards, who had come to colonize the area. Some of the plants are parasitic and grow on the palm trees. Along with the moss and tall grasses, the area looks pretty much like a tropical jungle. 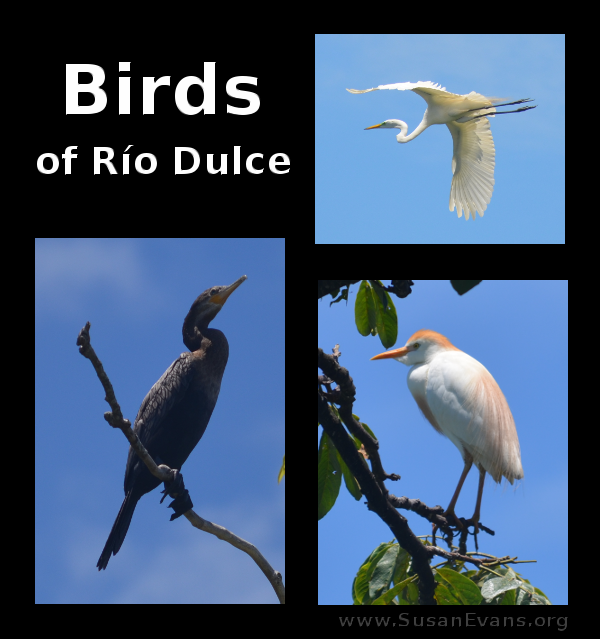 My husband took each of these spectacular bird pictures. I especially like the white one with the long neck. I captured that one flying in the video, too! We enjoyed this boat ride very much, since it was the first big event since landing in Guatemala. If you missed our first couple of rainy days, check out this post. 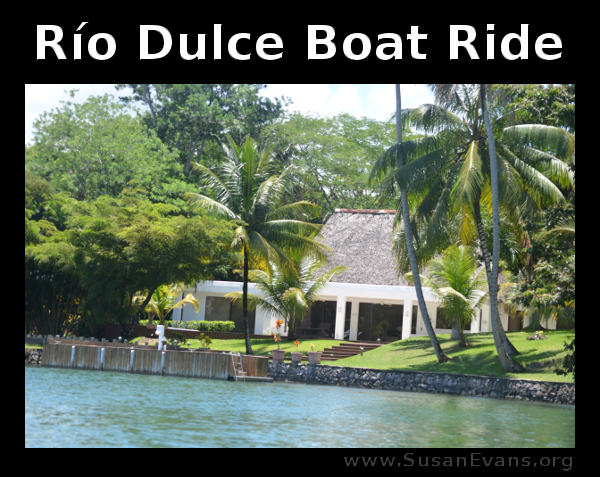 The Río Dulce boat ride happened on day 3, along with the Castle of San Felipe, which is coming up next! 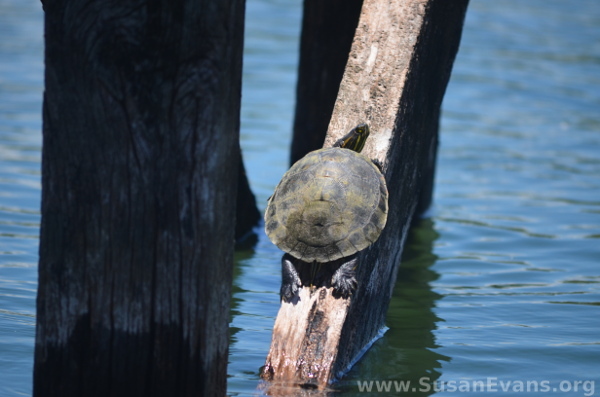 Don’t miss any posts in this Guatemala Adventure series! Follow my Missionary Kid page for extra photo albums and videos of random Guatemala activities we fit in around the edges of our trip. Our Guatemala adventure began as we landed in Guatemala City. Our friends Jorge and Alicia made sure that we were taken to the car rental place. The price of the van went up (probably because we were white), and an hour-long argument ensued. Finally we were off, following Jorge in our rental van to find my friend’s house, where my family was supposed to spend the first two nights. The late-night traffic in Guatemala City is gridlock. I’ve never seen such insane traffic in my life. Three lanes attempted to merge with three other lanes, all completely stopped, many of them honking their horns. We nearly scraped several cars as we pushed the nose of our van into the fray. We almost lost Jorge several times. Over an hour later, we were at a gated area where we needed a code to get in. My friend had never given me the code, so we called her. She didn’t answer her phone. By this time it was 10:30pm, dark and raining outside. I asked the armed guards with shot guns if they could buzz us through, but they said no. I jumped out of the van and hatched a plan with Christie (who came down to Guatemala for the same two weeks). I told her we should make a run for it, that it would be like old times. While she was processing what I had just said (and laughing at the bird-brained scheme), I turned and ran as fast as I could, past the armed guards. She distracted the guards to prevent them from shooting at me. As soon as I made it through the gated area, I saw houses with numbers much lower than the address I needed. I stood there in the dark, squinting without my glasses in the rain. If it had been daylight, I would have knocked on the door of a random house to ask where I was going. If I could only find my friend’s house and knock on the door, she would buzz us through. I shivered in the rain as I stood bewildered on an unknown street. I turned around and went back to the van, calmly passing the armed guards and smiling at them. Jorge invited us to sleep on his floor. My family was ravenously hungry after fighting through another hour of traffic to get to their house. My kids were in a goofy mood, considering the circumstances. They kept laughing hysterically at the billboards about mayonnaise and the ridiculous traffic that kept almost crashing into us. Alicia fed us reheated lasagna at midnight, and she and her husband vacated their large master bed to make space for three of us. They slept in their daughter’s room, since she was out of town, and my sons slept in the living room wherever they could find space. This was my daughter Rachel’s first flight ever. Growing up as a missionary kid, I had been in dozens of planes by her age! To keep up with this Guatemala Adventure series, follow my Missionary Kid page! 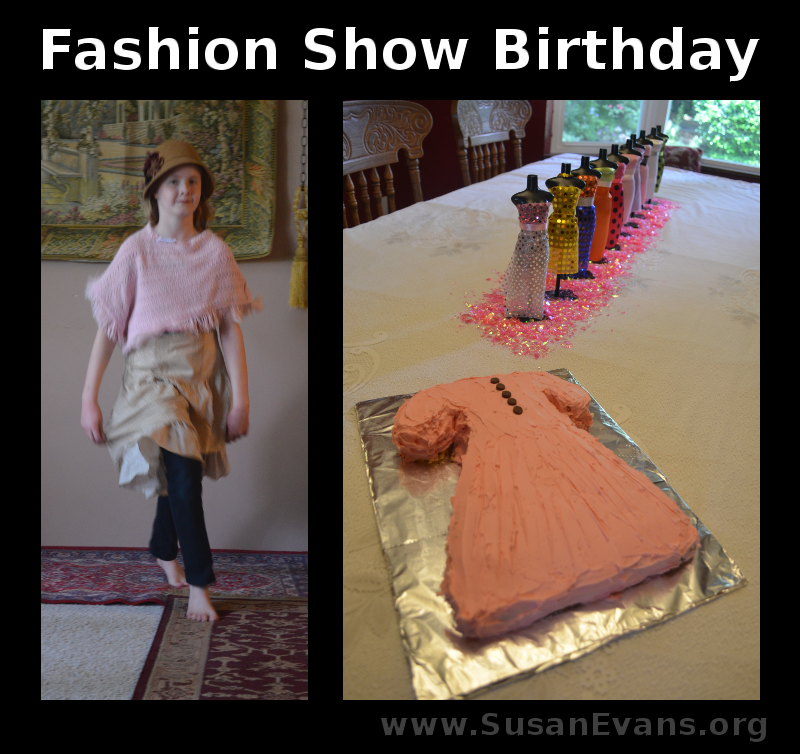 My daughter recently celebrated a fashion show birthday party. She had so much fun! 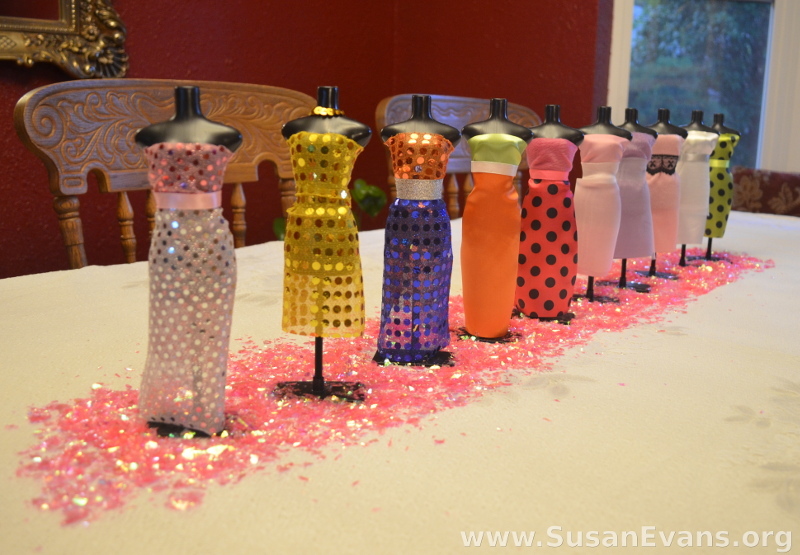 The party included a runway with dress-up clothes, a doll fashion show, and a dress cake! Our table centerpiece for the party was a miniature runway, with mannequins the size of Barbie dolls. (The kit we used was called Fashion Time Fashion Show, but you can create your own fashion show with actual dolls.) My daughter could decide what colors of cloth go together to make great outfits, and then she shoved the cloth into a vertical groove at the back of each mannequin. 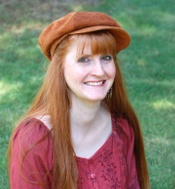 You can embellish your fashion outfits with ribbons or lace. As you can see, the table runway looked great! I used hot pink confetti for the runway on top of a white tablecloth with lace. 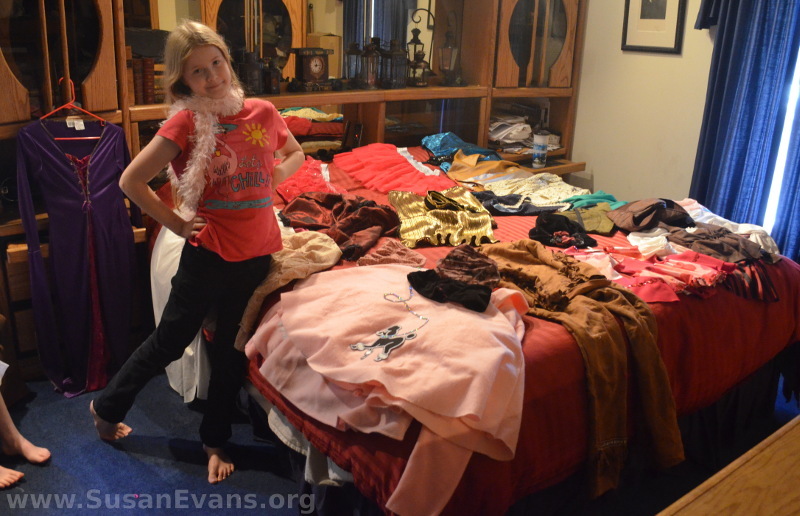 After opening presents, my daughter did another fashion show with her American Girl doll, placing new doll outfits on her that she had received as gifts from her friends. 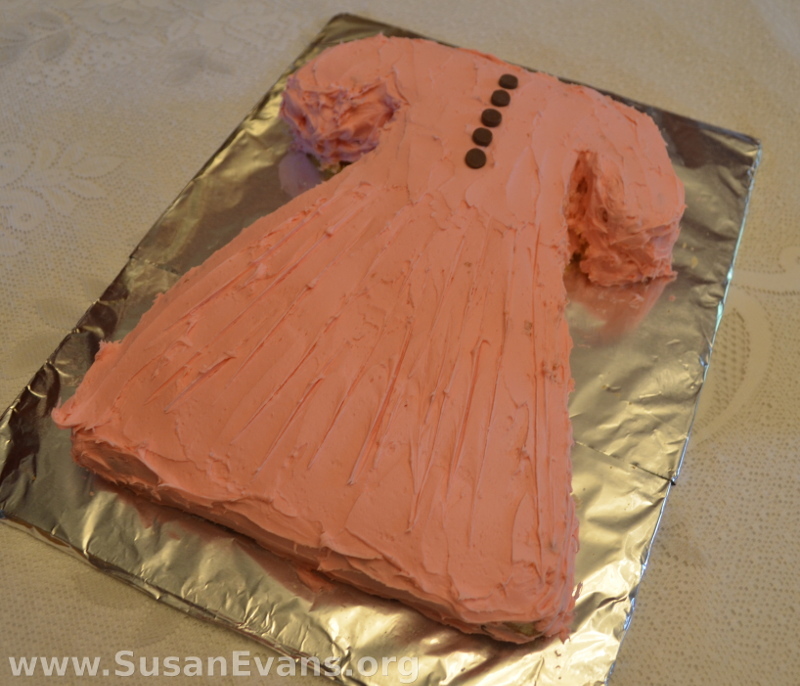 Next we made a dress cake. We baked a rectangular cake and let it cool in the refrigerator. Then we cut out the shape of a dress and placed it on a piece of cardboard lined with foil. We iced the cake with cherry icing, and we used chocolate chips for the buttons. I also created a pleated skirt effect by scoring downwards with a knife on the lower half of the cake. I took out lots of dress up clothes from previous activities we’ve done: the poodle skirts from our 1950’s party, medieval dresses from our Medieval Unit Study, hippie clothing from our 1970’s party, cowboy outfits, ruffled skirts, boas, and an assortment of hats. We made a red carpet runway down our living room by placing our hallway rugs end to end, and putting a wider red rug at the far end. The girls would turn around when they got to the end of the runway, to show off their fashions. The girls were having such a great time that the fashion show lasted a full hour! 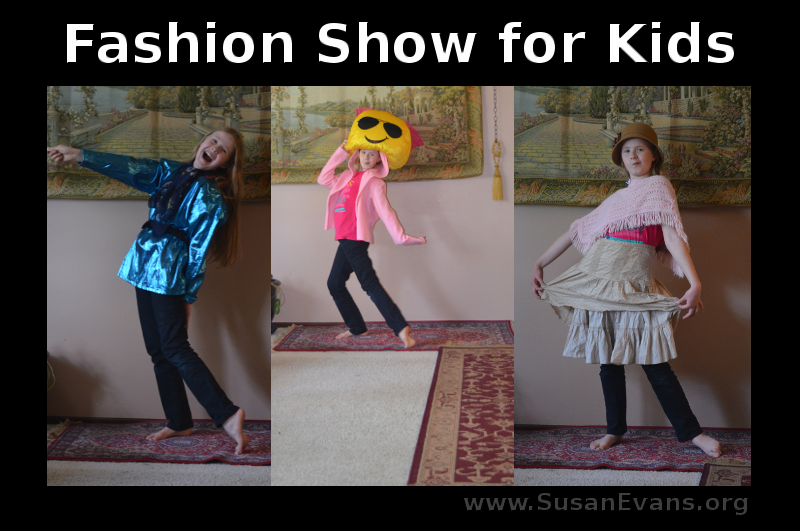 Who knew that a fashion show for kids would be so much fun?